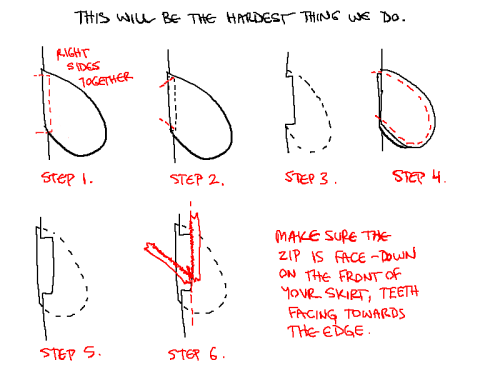 Thank you for purchasing How to Make Your Own Box-Pleated Skirt for Dummies! (Also known as The Idiot’s Comprehensive Guide to Stabbing Yourself in the Fingers With Pins Until You Magically Conjure a Skirt.) 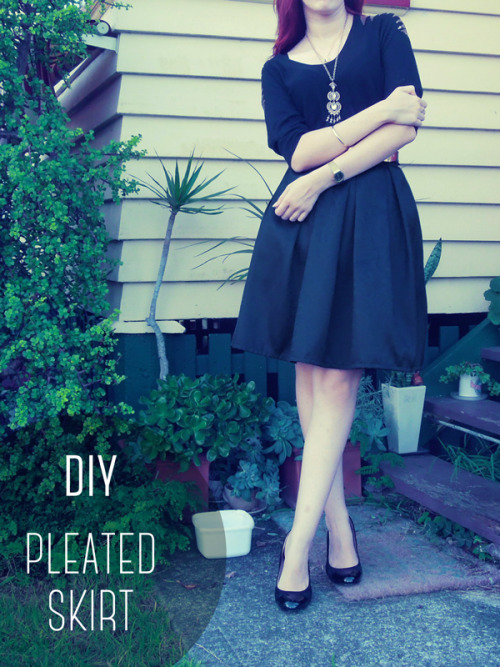 Today we’ll be going through the tutorial for sewing a full box-pleated skirt. My machine is awful, it can only do one type of stitch, so I will usually indicate when would be a good idea to change the stitching on your machine. While this tutorial is linear, it contains lots of optional steps that you can skip over–these are indicated. 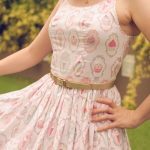 If you create a skirt using this tutorial, I want to see it! (Okay this part is optional, but I would really, really love it if you showed me! The first thing we need to do is to collect some figures. Measure your waist at the point where you would like the skirt to sit. Usually this measurement is a little lower than the smallest point of your waist but it can be your hips for all I care, this tutorial will still work either way. 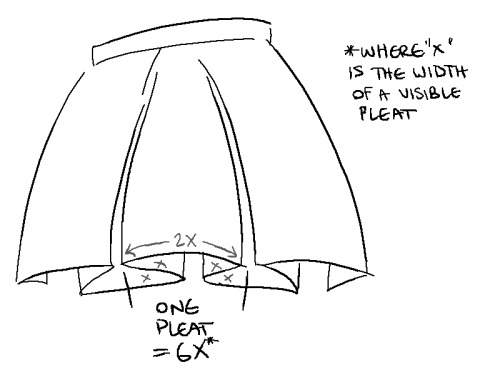 Figure out how many pleats you want in your skirt. I like an even number, so I will either do 6 or 4. The less pleats you have, the less full the skirt will be, so keep this in mind when you pick! Measure the length of your favorite skirt or what length you want the skirt to sit on your legs. There’s a whole philosophy behind the best length for a skirt like this, but that’s another post for another time. 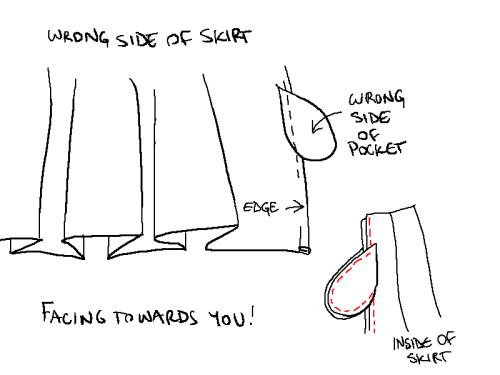 If you are making the skirt without pockets, you just need one unbroken piece of fabric (3A + 2C). 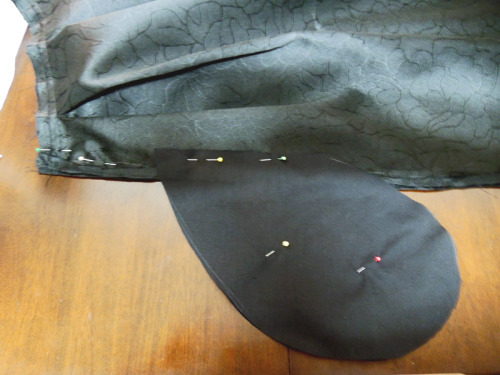 If you are making the skirt with side pockets and adding the zip to the back, you will need 3 pieces–One panel (1.5A + 2C) for the front, and TWO (.75A + 2C) panels for the back. You can only choose this option if your overall number of pleats are an even number. 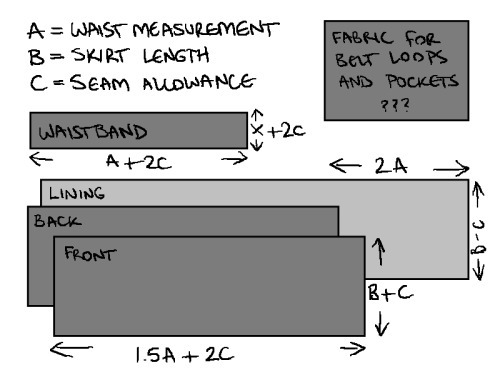 If you are making the skirt with side pockets and a side zip concealed next to one of the side pockets, you will need two pieces of fabric like the above diagram (1.5A + 2C). These methods are numbered easiest to hardest, so naturally we’ll be showing you the hardest method so the lessons learned can be applied across the other methods as well. 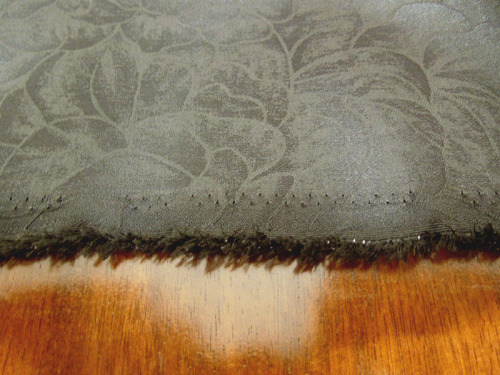 Things like the lining and waistband fabric will stay the same throughout any of the methods. Tip! 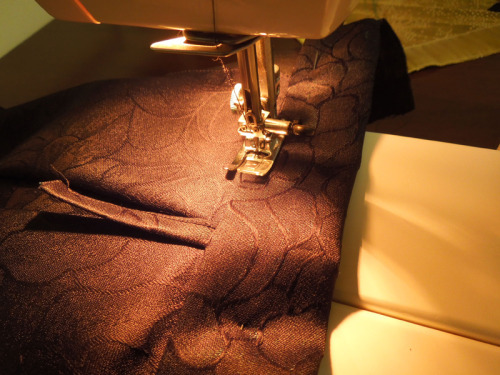 If you’re a beginner, keep your seam allowances as generous as you can. No matter how many pleats you’re making, you’re going to need the exact same amount of fabric. Such a weird phenomenon, hey? Say Sally has decided on four pleats for each side. She takes her front skirt panel which is 144cm long (this figure doesn’t include your seam allowances, PLEASE ADD ENOUGH SEAM ALLOWANCE ON THE SIDES!!) and divides it by the number of pleats (144/4=36). Each pleat will need 36cm of fabric. As per the diagram above, 6x = 36, so we have to solve for x. Divide 36 by 6 and we get 6. Now you know how to mark up the fraying end of your material. 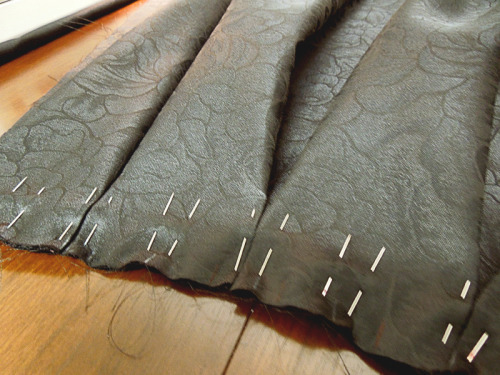 Now you have to fold your pleats and secure with pins. Use the diagram above to help you with this step. If your markings are 0cm, 6cm, 12cm, 18cm, etc, at 6cm, you will want to fold the fabric towards the ceiling, and then back down again at 12cm. Then you skip a marking because the visible pleats will take up two markings wide and do the opposite with the other half of the pleat. It’s important that the pleats are neatly folded to touching in both the front and the back, like the below photo. 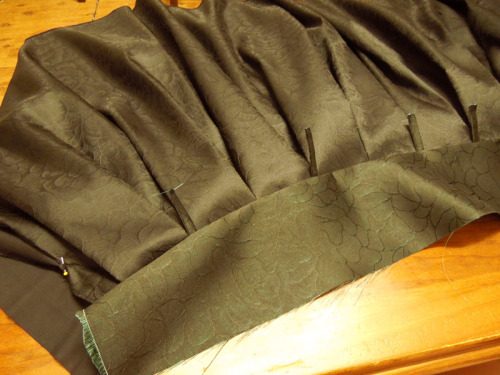 This is what gives the skirt that “full” look (well, that and a pleated lining). Use as many pins as you need, there’s no cheating here. Hold it up against your waist at some point to see if you’re heading in the right direction and it’ll be big enough. I had to adjust the pleats a couple of times because I underestimated and made the waist too small for myself. Now that you’re done with that, we get onto the actual sewing part. For simplicity’s sake, I sewed straight over the pins with a straight stitch. I didn’t have an issue with this but in general, if only to cover myself, you probably shouldn’t do this because it may damage the needle of your machine. 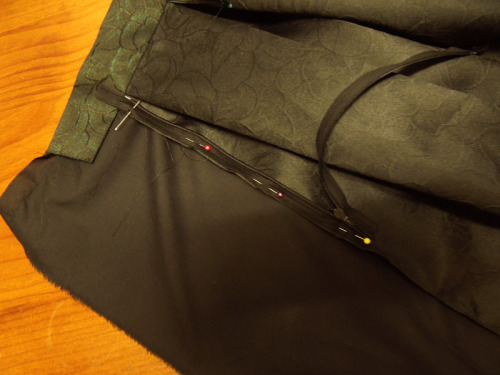 I guess you could use binder clips to hold the pleats together if you have particularly rigid material like I do, but if your fabric is light, you’ll be able to hold on with your fingers as you sew. Do this to all the skirt panels you have, yay! 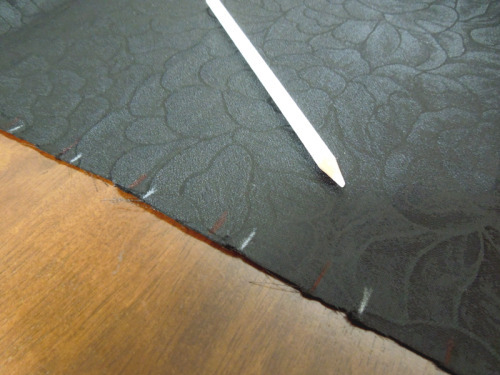 You can either use your lining fabric for this or your main fabric, it doesn’t make much of a difference. 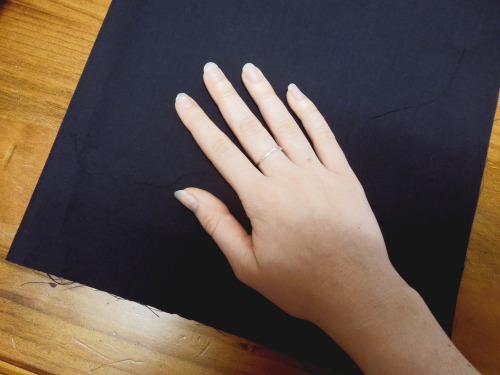 Put your hand on the fabric and cut a good 5cm around your hand in a kind of teardrop shape shown above. You’ll need two mirrored pieces for each pocket, so use your first piece as a template for the rest. 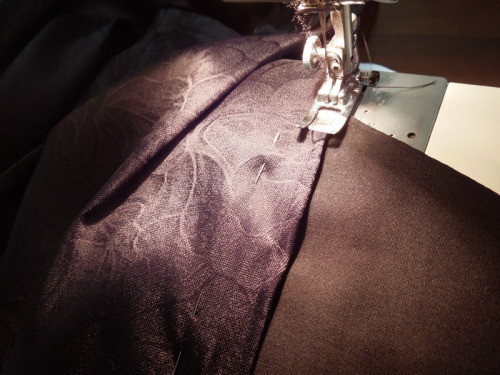 My pockets are made from lining fabric and it’s the same back to front but keep in mind that you will want the right sides sewn together if you’re making them from fancier fabrics. Figure out what a good height the pockets should be for your arms (not too low or too high) and measure from the very top of the skirt to where the top of the pockets will be, keeping in mind that it’ll be a bit lower than that because of seam allowances. I folded over the fraying side of the skirt and sewed it down at some point because I wanted it to feel neater inside my pockets. Straight edge to straight edge, sew down the side of your pocket to your skirt. Even if your pleat ends 3cm earlier, you will wanna sew to the edge of your folded-over seam allowance–it’ll hide the fabric inside your pocket a little better. The last skirt I sewed, I made this stitch right along the line where the two panels of the skirt were meant to be joined down the side and you can see the stitching of the pocket when I wear it. If you like this, by all means feel free to do what I did the last time around but if you want to keep your pockets hidden, you’ll want to do it this way. Here’s a nifty little diagram that shows you how simple it really is. Putting the right sides of the skirt together, and making sure that your pleats are aligned on both sides, starting at the beginning of your first pleats (so it looks like there’s no break in the pleats on the side), sew down the side of the skirt in a straight line until you reach the pocket, then sew around the edge leaving enough seam allowance the whole way around. 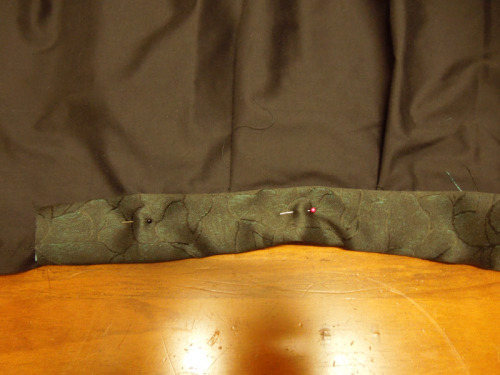 Then you continue down the side of the skirt (which you thoughtfully pinned together). If you’re putting a zip in the back instead of hiding it next to a side pocket, skip the next step and just do the above to the other side of your skirt as well. 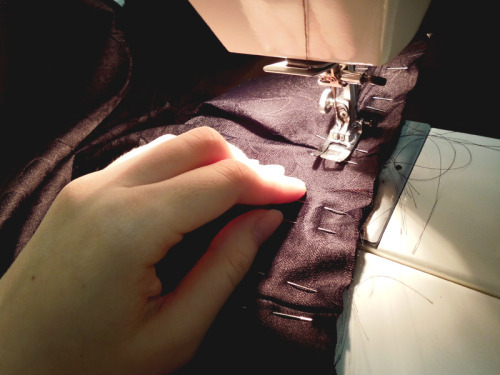 Optional: Sewing an invisible zipper next to a side pocket. Put the pocket and skirt right sides together. Instead of sewing top to bottom like we did on the other pocket, we will be sewing in a rectangular method as demonstrated. Using a pair of scissors, cut on the red lines (not too close to the damned stitches you just made or you’ll be in a hell of a lot of trouble). Flip the pocket around the other way and iron or otherwise smooth (who can be bothered with ironing, seriously) down the pocket so it somewhat resembles the photograph above the diagram. It should have square edges. Flip it back the other way and align the other side of the pocket on top, sewing around both where the red lines indicate. Now when you flip the fabric inside out, it should look like this (see the photo above again). Step 5.5. (Not pictured) Unpick stuff if need be, it’ll probably get a bit messy. Now is when you add on a zipper! So long as it looks like the photo below, you shouldn’t be in too much trouble. 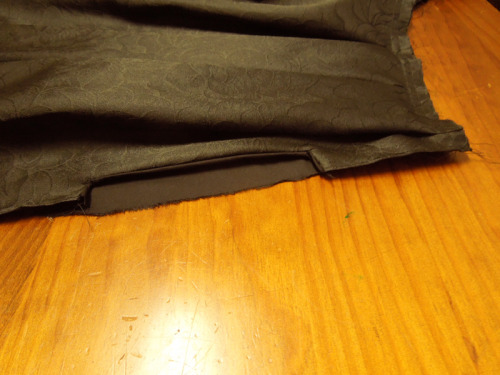 Here you can either make the zip start from the very top of the waistband/skirt, or if you’re planning on making your waistband with a closure like I did, you can start it from where the waistband theoretically finishes and hide the end bits of the zip under the waistband you’re sewing on. If you’re just adding a zipper with no pockets to mess around with, do this same thing but with the plain side of the fabric. It will be a lot easier. 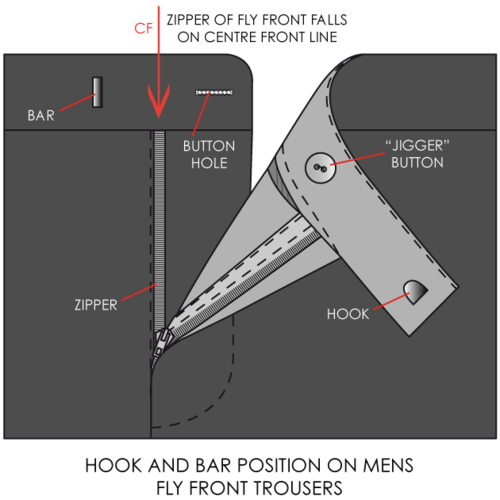 Nowadays there are several methods for sewing on invisible zips. I haven’t yet figured out how to put an invisible zipper head onto my machine, but I do know that it’s pretty easy to hand-sew them. 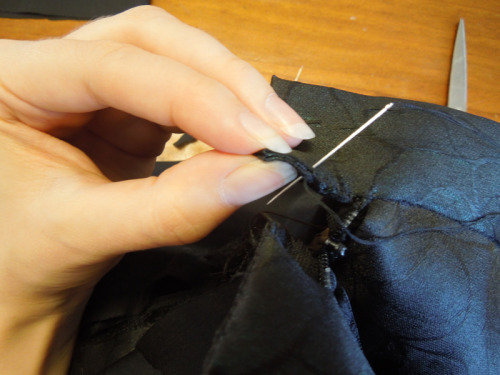 Push the plastic teeth of the zipper as far away from the fabric of the zipper as you can and straight stitch as close as you can to the plastic teeth, that’s all there is to it. 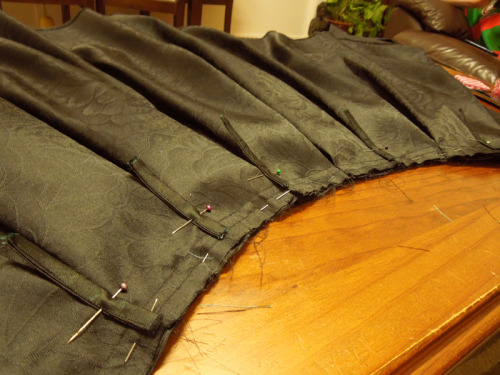 Don’t sew the other side of the zipper down yet though because it’s easier to work with one long train than it is in a circular motion–too much fabric everywhere. Now onto the fun stuff. Finishing touches. The lining underneath doesn’t have to be box pleated, but adding in a few pleats is definitely recommended for simplicity’s sake. 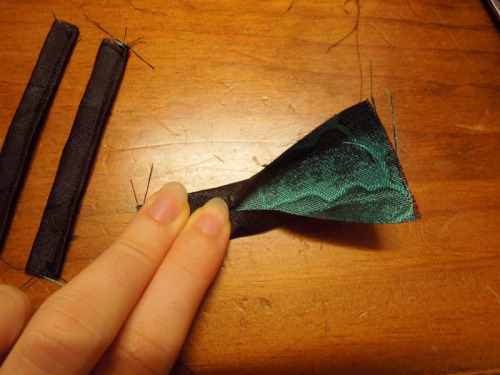 The other option you could do is a straight tube lining but this way is easier and it’ll help add shape to the skirt. Just make sure you test it around your waist to see if it will both fit and cover your bum at the same time. I left a lot of seam allowance on the sides of the lining just in case I needed it. 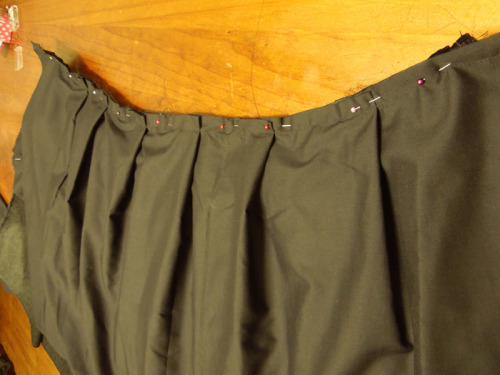 Align the fraying end to the top of your skirt and pin it down, leaving the non-fraying end at the bottom. I love wearing belts so it makes sense for me to make belt loops. Fold the sides in so they meet in the middle, then fold the whole thing in half and sew one edge down so it stays put! I put two in the front and three in the back right on the pleats. You have to pin these down as well so they don’t move about. 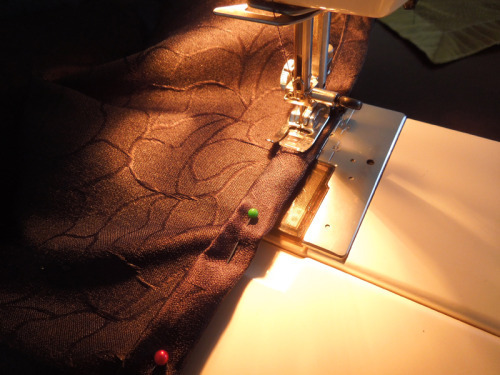 Put your waistband face-down on the right side of your skirt and with the sewing machine, do a straight stitch over the entire sandwich of fabric, making sure that your stitches aren’t wobbly and are a consistent length away from the top of your skirt so your waistband is the same height the entire way around. In order to do this, I sometimes make the seam allowance as wide as I want the waistband to be, so I can align it to the top of the skirt and sew it on that way. Beats using interfacing anyways. 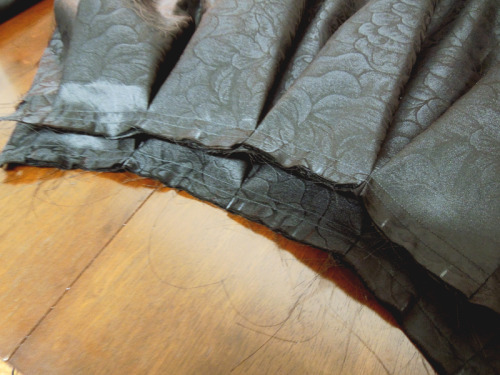 Take the waistband and roll it over to the inside of the skirt, pinning down the fraying edges as shown above. 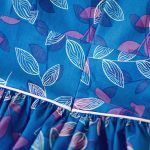 When you’re sewing the back part of the waistband down, you’ll want it to be a little wider than the front width of your waistband because you’ll be sewing from the front of the skirt. This is done so that you can’t see the stitches, so you pretty much have to be very, very precise and sew where the waistband meets the skirt, as pictured above. Now is when you can sew in the other side of the zip down. I don’t remember why the picture doesn’t reflect that but I know it was at this point when I sewed both sides of the skirt together like how we did to the other pockets. If I did this again, I would sew the sides of the skirt together from the bottom of the zip to the bottom of the skirt, make sure the zip was in the right place, and sew on the remaining side of the zip. I sewed in the zip before I sewed the skirt sides together and that was a little troublesome for me because I had to hand-sew the skirt together at the bottom of the zip because the sewing machine couldn’t quite make it around the zip. 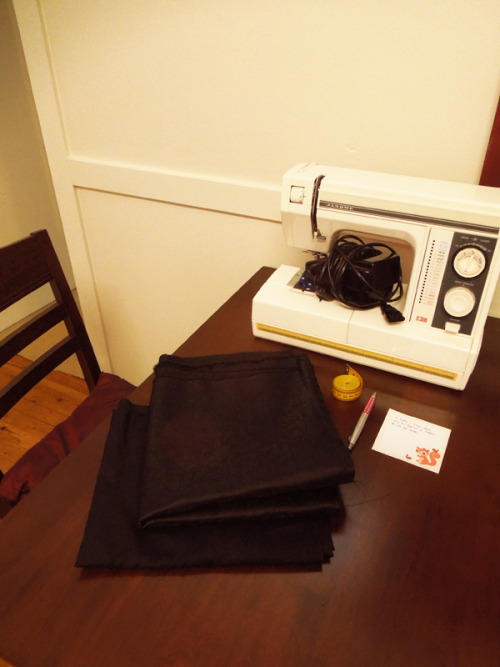 Now that your skirt is an entire skirt, you can roll up the generous seam allowance on the bottom of the skirt (I didn’t have a generous seam allowance, but in general, the wider the hem, the better your results will be) and sew it down. I had to do this with a straight stitch because of my stupid machine but if you have an invisible stitch setting on your sewing machine, that would be really great too. You can do this with the lining if you want but I didn’t bother because of the non-fraying end and the fact you can’t really see the lining. I then cut off the excess waistband, folded it in on itself so that the ends were squared off, and hand-sewed them down, making sure to unpick some stitches at the top of the zip and shove the ends of the zip into the waistband before sewing it closed again. 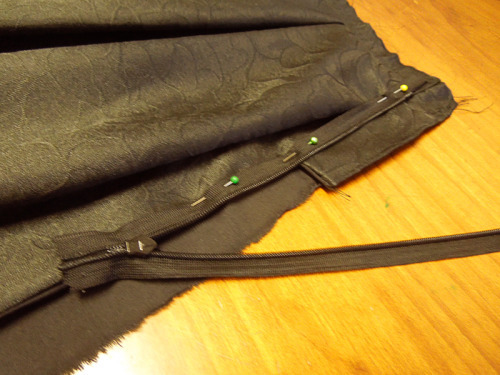 If you’re planning on adding hooks to this part of the skirt and you haven’t sewn your zip all the way to the top, always make the left side of the waistband longer than the right. So, the opposite to the below diagram, because we are ladies. I can’t do button holes on my machines so I just sewed in a snap closure instead. Same deal. I have good news, are you ready to hear it? You’re done with your skirt, congratulations! Hi, there! Thank you for this awesome tutorial! I am horrible at math, but this was written so plainly that I was able to figure it out :-) I am going to make this skirt asap. I do have one question. I am going to make the second option using three panels. On the second digram, we divide by 6 to figure out the pleating. Why is the number 6 used? I do see the little x’s on the diagram and I see six of them, but what do they represent? A fold? I am a bit confused. Can you break that down a little more for me? Thanks!! I am interested in making a skirt like this but with three color stripes for my toddler. I was thinking red white and blue, with the white being inside the pleats and the red and blue on the outside of the pleats. For the math for the stripes, I know i need six times the pleat width for the pleats, would it be equally spread between the colors? Does this even make sense? Ah be very careful with your measurements! You’ll need three times the pleat width, not six. For example, if your pleats end up 1 inch wide, there’ll be three inches of fabric going into that pleat. There’s only 1/3 of the pleat that will technically be visible, so if you wanted white inside the pleats, you’d ideally have 2/3 of the fabric white and 1/3 coloured.. But you have to factor in how it would look at the bottom of the skirt where the pleats aren’t gathered and what kind of outcome you want. So you could also do it with fabric alternating like 1/3 white, then 2/3 red, then 1/3 white, then 2/3 blue, then repeat (i.e. 1 inch white, 2 inches red, etc etc) Whatever you do, it’s important that the pattern repeats itself exactly the same way for all the pleats. Now I hope I’m the one making sense, haha! Great instructions! I made this out of a silk blend light material and turned out perfect. Lots of compliments, so easy to make. Thanks! I put this skirt together in couple of hours with a relatively heavy fabric to give the skirt some shape. I love it and get plenty of compliments! Thank you for your great tutorial! 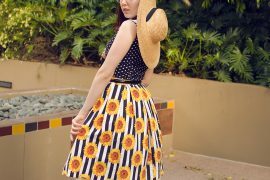 I am going to make a dress with a full, pleated skirt, (I’m also going to wear a petticoat underneath to add fullness) and I was wondering if I should make it the same way as you made this skirt? Would the length and fullness change anything about how it was made or would the rectangle pieces still work great? My material is striped so I’m hoping that it will work to cut rectangle pieces! Rectangles will definitely work! Of course it all depends on how full you want your skirt to be, because you’ll notice that a lot of vintage dresses have really tiny pleats or gathering to fulfil this criteria, so they use a bit more fabric than my tutorial, but still have a rectangular shape. I hope that helps and in glad you like my tutorial! I wish I could sew! Envy you so much, dear! Beautiful skirt! It is a little in-depth but only because of the lining and the pockets–If you make a skirt without these, it’s a super, super simple concept. I’ve already made two and now I’m just thinking about how to create a bust piece for it to make a dress the next time around!